Facebook memories. Don’t we all just love to hate them? They spout out the good, bad and the downright ugly. 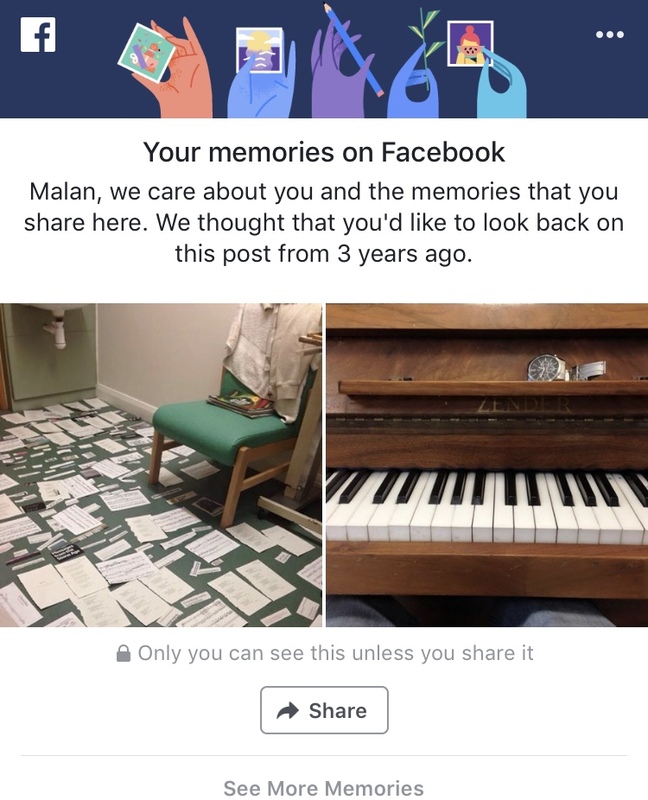 I woke up this morning to this memory (image above). It’s a photo I took in my hospital room 3 years ago. At the time, it all made perfect sense. Every single piece of paper laid down on my floor was paramount in unearthing a new truth; it amounted to finding a reason for my existence when inside, I felt empty and hopelessly suicidal. To others, I suppose it looked like a fully blown mental breakdown. But, for me, it was a journey I had to take. It was going to change everything. It all looks a bit mad now right? But it really wasn’t at the time. Upon hindsight, it could be one of the reasons why I am still here today. I had just started playing the piano after a decade of silence. It was deemed good for my therapeutic development. I was accompanied on a nightly basis to the music room by a nurse or health care worker and they would sit there while I played. To my amazement, I remembered everything; I would spend countless nights playing Chopin, Rachmaninov, Beethoven and Frank Bridge – anything I could basically remember without the music. I’d been emotionally numb for a long time, unable to really show emotion. Playing made me cry. It’s been an eventful 3 years – a period of fluctuating moods, major decision taking, medication reviews and changes in life priorities. I have felt my grip on life both tighten and loosen during this period. Being in hospital is one thing, but the private struggles that I experience out in the community largely go unnoticed. Hospital admission is nearly always merely the tip of the iceberg. I’m not a huge fan of looking back, but at times, doing so offers perspective and gives one a sense of distance traveled. I am currently in the process of writing a book about my life, something that would have felt completely impossible three years ago. It’s been a real pleasure, but at times, hugely demanding emotionally. It was always going to be that way. I knew from the very beginning that there was absolutely no point contemplating such an undertaking if I wasn’t going to be emotionally invested in it, and I have been. Confronting my past has been both cathartic and deeply unnerving. The dichotomy of the whole experience has proved a real challenge. Never has pleasure felt so closely connected to fear. On a certain level, the work at times feels like all that I am, but having said that – I have also had to try to keep a part of myself back, so that I have something to work with when I feel I’m running on empty. I sometimes catch myself trying to imagine how I’ll feel when I’ve finished it all, but the thought scares me so much I don’t get much further than that. Perhaps after three years of living with Depression and Borderline Personality Disorder, I thought I’d have some real pearls of wisdom to share with you, but truth is, I don’t feel I do. What looks like sheer madness 3 years ago made perfect sense back then. On the one hand, I have accomplished more than I thought I ever could in the last three years, but moving forward, I don’t feel I can take anything for granted. The last 3 years have taught me that all we really have at any one time, is the moment that we are in, and these moments are forever shedding their skin to make space for new time. We are quick to diagnose and see ‘madness’ but perhaps not so quick to understand that we do only what we feel we have to in the moment, each moment being different and wonderfully complex. So, where will I be in 3 years? I dare not answer that question or insult the astonishing fluidity of time by predicting an outcome. Let’s just wait and see. Previous Let’s talk about Borderline Personality Disorder and impulsivity!